In 2009 I quit my job, loaded my bicycle, sold, gave away, recycled, threw out everything else to travel the roads of Australia. Time is flying past and the preparation continues. Last week, looking at the list decisions to be made and tasks to be done, it seemed grim. But, rapidly it has improved. Foot wear has been continual problem. What to wear? I have a home made pair of sandals, that continually needs repair. A pair of Merrell sandals that aren't great. I've modified to improve the fit. They are almost worn out, but I can't bring myself to throw out yet. And a pair of Vibram Five Finger (VFF) Trek Ascent that are worn, but not completely worn out: the pair I walked the Bibbulmun Track in 2017 in. Starting a 2000km+ walk, none of those are going to last the distance. I need new shoes. But what? My feet are large and broad. Modern shoes are weird. Really weird. High heels for everyone. Something that started with calvary riders to keep help their feet on the stirrups when standing and shooting arrows, became a way to show you were rich enough to afford expensive heeled boots. Then there are pointy toes. Peasants had broad wide feet, so the aristocracy showed they were better by wearing pointy shoes. Because the heel is raised, the sole is hard, so to make stepping easier, the toe area is raised to help the 'step off' part of walking. And then, the edges of the shoe are raised as well. 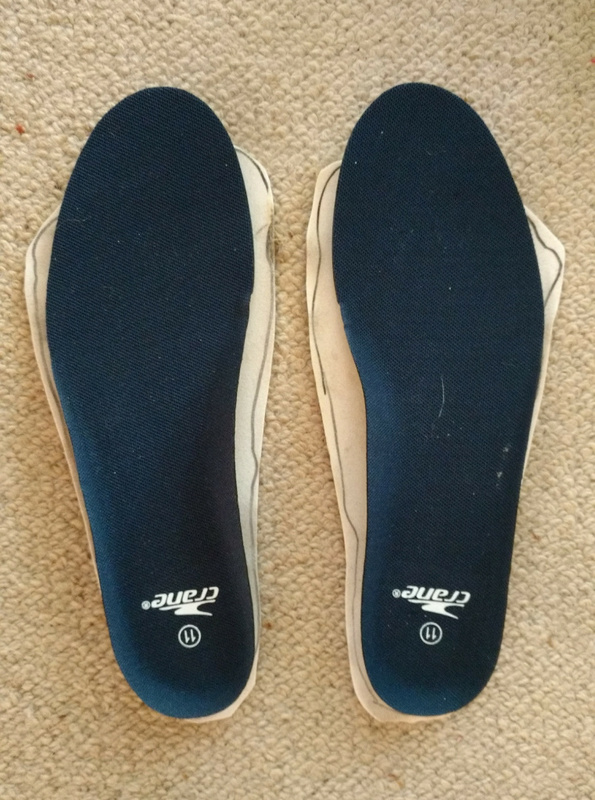 I'm not sure if this is a "feature" or just the effect of injection moulding when attaching the top of the shoe to the sole. The edges get more material, to hold the top on, but the center gets less, so the foot bed becomes boat shaped. The insole goes on top of the foot bed and attempts (unsuccessfully) to fix this. I've tried the conventional shoes. I really wanted to be able to use them, just because of the ease of finding them. But on the practice walks, I just couldn't keep them on. My feet started to hurt. Worse, the changes wasn't just the feet; the knees, hips and back too. Months of join pain, toes jammed up, and pushing the cart in heels wasn't want I wanted to do. (There are problems with wearing heels. The higher the heel, the worse the problems. Researchers use women's high heels for their studies as they are so extreme, but most shoes have heels. Unless you are wearing 'zero drop' shoes). I really wanted sandals, but haven't been able to find any that tick all the points I want: a flat foot bed, zero drop, no toe raise, no squashing the toes together and no toe post. Such a sandal surely exists somewhere. But for now, every time my feet hurt, my go to fix-it shoe is the VFF. I walked the 1000km Biblumun track in VFF's. They work for me. Why was I spending so much time on footwear when I could just wear them again. Decision done. Decided. Now, where to get a new pair. Sadly the Trek Ascent model I have is no longer made. I only had that model through a series of chance events, so this time I wanted to try on different models. Luckily Sydney has Barefoot Inc. It's conveniently located near Green Square Station, Alexandria. Three times I went to look and try on different shoes before I decided. Besides VFF, I was also looking at Lems, Vivobarefoot and Xero shoes. The staff wear the shoes they are selling. So are able to give real feedback on the different models and their best use. They couldn't have been more helpful. I left with not one, but two pairs of new VVF. It was a great deal that was too good to pass up. My feet are thanking me already. The two pairs are old stock. Models no longer made. I'll definitely be back to Barefoot Inc in the future. Interest point: For anyone thinking that you can't wear barefoot shoes on the road for long distances: Raw Running. In 2013 this couple ran 15,782km around Australia, running 366 marathons (43 km) each in 366 days, no days off in barefoot shoes. Sorry, because of spammers. I now approve all comments. This could take a couple of days, depending on when I get internet access. Since 2009, I've had no fixed address. I live in a tent, and travel the roads and trails of Australia. I'm not a photographer, or an writer, just a solo traveller. This site is to let family and friends keep track of me. Maybe you will find something interesting here. Broken frame solved. Surly offers replacement.